Do you know that CNET News.com website has hundreds of Technology Videos about gadgets tips, etc ? The videos have been there since beginning, the content is great but still they aren't as popular as other technology video podcast shows. Because CNET never told you about them. Well, all this is expected to change now with the launch of CNET TV, CNET's latest venture into video podcasting which is way ahead of any of the amateur vidcasts floating on the web. CNET TV will have all video that you see on the regular CNET website plus some exclusive programs. You can attach tags to videos, rate videos, add videos to your playlists and then share the playlists with your friends. CNET TV website is done in Macromedia Flash. The Video player comes with a software remote that looks very much like a regular TV remote in design as well as functions - you can drag it around the screen by simply holding with the mouse - it also lets you control the color/saturation levels of the video. CNET's service is still in beta but impressive already. Though the videos are produced by a "corporate house" they have an element of humour which you generally see in vidcasts like RocketBoom and GeekBrief TV. CNET hosts are good looking too. Google Videos or Youtube are great sources for finding tech videos but only a handful of the videos found on these services are worth your time. Either the audio quality is bad or the content is not good enough. Since CNET TV is done by professionals, they are cool to watch and save you the effort of finding quality content on the web. It's all at one place. 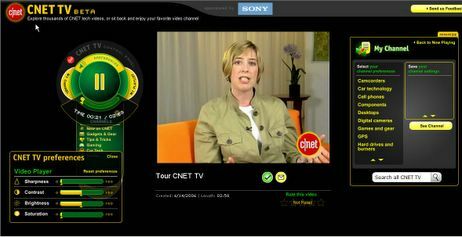 In my view, CNET TV is addictive if you have the time and bandwidth. Some things that could make the service even better will be RSS Feeds, ability to bookmark videos or permalinks, "No Registration" for watching videos and "Save Video" links to download videos and watch them offline.